Last week I wrote a blog post in which I shared a message I received from a young man that I met almost a year ago. That young man contacted me again recently, and his message - and story - were so powerful that I knew it would be selfish to keep it to myself. It needed to be shared, and so I did, here in this blog, and then, with some minor changes, at my Huffington Post Alberta blog. You see, when I began this blog almost two years ago it was simply a way of telling my story of life in Fort McMurray. Over time I began to see that the blog could be used to tell the stories of others. Even more importantly it could become a way to share the story of those who often have no way to tell their stories, and who find their stories overlooked, ignored, or forgotten. It's why I began telling the stories of our local homeless population. It is what led me to an event called Homeless Connect, and a young man named Adam who shared his story with me. This past week when I submitted the blog post to HuffPost I knew it was a powerful piece, but not because of my writing. It was powerful because of Adam. It was powerful because it was the story of being homeless from someone who had experienced it. It was powerful because it was authentic and sincere and genuine and true. It was powerful because of his words. 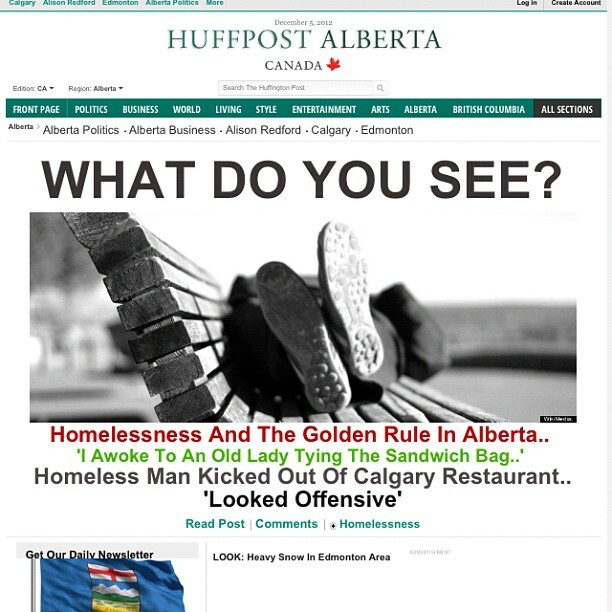 My post, but more importantly Adam's story, was the front page cover story for the HuffPost Alberta website. His words had gone across the nation, and were being read by thousands of people. His story, his words, had power. They had reach. And they would have impact. Since writing that blog post I have received messages from many people - those who work with the homeless across this country, and those who read it and were touched by Adam's story. Most importantly, though, Adam and I have been in constant touch as I have shared with him how his experience, and his words, were now reverberating around our nation, and very likely changing the way the homeless are viewed. At the very least I truly believe his story made people stop and think about their own opinion of those we see on our streets every day, and about their treatment of them. Adam has expressed his thanks to me for sharing his story across Canada, and for hopefully helping to change some of the stereotypes and myths about the homeless. In the end, though, it is not Adam who needs to be thankful. It is me, thankful to him for trusting me enough to tell his story, thankful to this community who has supported me as I have explored these stories and tried to understand those who tell them, and thankful to all of you who choose to read and share my words. In the end it isn't my words that make the difference - it is all of you who choose to read them, share them, and allow them into your heart. That is where the difference is made, and not in this blog at all. and to allow me to share it with you.